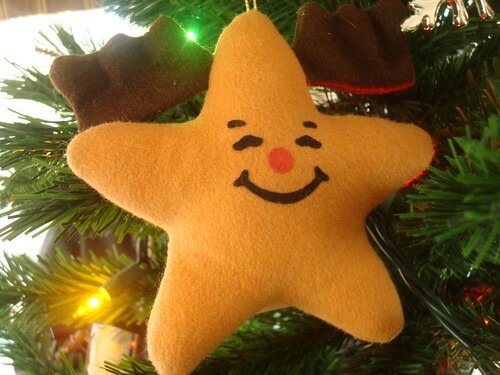 I don't know if anyone else remembers these, but back in the late eighties/ early nineties Carl's Jr would do a holiday promotion where they put ornaments in their kids meals. It played off their star mascot, but dressed up in various holiday costumers--I most strongly remember the reindeer, mouse, and a snowboarder. Since Carl's Jr was my mom's go to fast food place (at the time they had a salad bar! ), my brother and I would try to collect them all. I don't have tons of them now (not sure what happened to them all) but this little guy makes me smile every time I see him on the tree. Awesome! Thanks for linking. : ) I had no idea there was a tree topper at one point!